For the earthquake of 21 July 2013, see 2013 Seddon earthquake. The 2013 Lake Grassmere earthquake was a magnitude 6.6 earthquake that occurred at 2:31:05 pm (NZST) on Friday 16 August 2013. The epicentre was located about 10 km south-east of Seddon, under Lake Grassmere, with a focal depth of 8 km. The earthquake caused significant land damage in the local area, with landslips blocking roads, including the main highway between Blenheim and Christchurch. Buildings in Seddon were damaged, with some being declared uninhabitable. 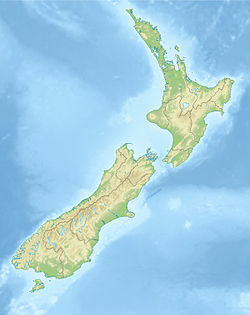 The earthquake was widely felt in both the North and South Islands of New Zealand. This earthquake is considered to be a doublet of a magnitude 6.5 earthquake that occurred in Cook Strait on 21 July 2013 and is thought to have occurred on part of the same complex of faults. It started its own aftershock sequence, with several magnitude 5 and one magnitude 6 earthquakes occurring in the first few hours after the main shock. The earthquake generated a significant series of aftershocks, the largest of which had a magnitude of 6.0. Below is a list of all aftershocks magnitudes 5.0 and above that occurred in the region between 16 August 2013 and 5 September 2013. In Wellington, the earthquake caused minor damage to buildings, breaking some display windows and cracking plaster. Many central city office workers left work early, and with all suburban train services cancelled for urgent track inspections, bus services overloaded and traffic gridlock occurred on major roads out of the city for a couple of hours. The City Council ordered the deconstruction of a 30-year-old lift shaft that had been damaged in a previous earthquake in July, after recently installed emergency seismic restraints failed. Several surrounding buildings in the fall zone were ordered to be evacuated. The quake caused substantial damage to a number of residential homes in the Seddon area. Eight houses were evacuated by The Marlborough District Council and another 11 allowed only restricted access. The quake was felt as far north as Auckland and far south as Dunedin. Damage was reported in the Kapiti Coast, Hutt Valley, Wellington, Blenheim, Ward and the rest of West Upper South Island. ^ "M 6.6, Lake Grassmere, 16 August 2013 – Earthquake – GeoNet". info.geonet.org.nz. Retrieved 11 December 2015. ^ Fenaughty, Kevin (17 August 2013). "Damaging quake hits the north-east of the South Island". Geonet. GNS Science. Retrieved 17 August 2013. ^ "New Zealand Earthquake Report – Magnitude 6.6, Friday, August 16, 2013 at 2:31:05 pm (NZST)". GNS Science. Retrieved 17 August 2013. ^ a b "M 6.6 Lake Grassmere Fri, Aug 16 2013". GeoNet. GNS Science. Retrieved 23 November 2018. ^ "Little fault blamed for big jolt". Stuff. Retrieved 23 November 2018. ^ a b "M6.5 – 29km SE of Blenheim, New Zealand". earthquake.usgs.gov. Retrieved 11 December 2015. ^ "GeoNet – Quakes". www.geonet.org.nz. Retrieved 11 December 2015. ^ "M5.4 – 25km SSE of Blenheim, New Zealand". earthquake.usgs.gov. Retrieved 11 December 2015. ^ a b "M5.5 – 30km SSE of Blenheim, New Zealand". earthquake.usgs.gov. Retrieved 11 December 2015. ^ "M4.9 – 27km ESE of Blenheim, New Zealand". earthquake.usgs.gov. Retrieved 11 December 2015. ^ a b "M5.9 – 26km SSE of Blenheim, New Zealand". earthquake.usgs.gov. Retrieved 11 December 2015. ^ "M5.1 – 30km SSE of Blenheim, New Zealand". earthquake.usgs.gov. Retrieved 11 December 2015. ^ a b "M5.1 – 27km SE of Blenheim, New Zealand". earthquake.usgs.gov. Retrieved 11 December 2015. ^ a b "M5.9 – 30km ESE of Blenheim, New Zealand". earthquake.usgs.gov. Retrieved 11 December 2015. ^ "M4.8 – 35km ESE of Blenheim, New Zealand". earthquake.usgs.gov. Retrieved 11 December 2015. ^ "M5.0 – 33km ESE of Blenheim, New Zealand". earthquake.usgs.gov. Retrieved 11 December 2015. ^ a b "M4.7 – 28km SSE of Blenheim, New Zealand". earthquake.usgs.gov. Retrieved 11 December 2015. ^ "M4.8 – 29km S of Blenheim, New Zealand". earthquake.usgs.gov. Retrieved 11 December 2015. ^ a b "M5.2 – 29km SSE of Blenheim, New Zealand". earthquake.usgs.gov. Retrieved 11 December 2015. ^ a b "M4.6 – 31km SSE of Blenheim, New Zealand". earthquake.usgs.gov. Retrieved 11 December 2015. ^ "M4.8 – 34km SW of Brooklyn, New Zealand". earthquake.usgs.gov. Retrieved 11 December 2015.